William G. Knoebel has more than 26 years of experience handling workers compensation cases in the Commonwealth of Kentucky. He frequently presents seminars on how the complexities of handling disability cases and is a member of multiple local and national groups who focus their practice in the areas of Workers’ Compensation, Social Security Disability, and Supplemental Security Income cases. He can help you with your case, from the initial application through all levels of appeal. He has represented clients at hearing offices in Florence, Ashland, Lexington, and Louisville. When you file a claim for workers’ compensation benefits due to an injury at work, your employer or insurance carrier will most likely respond with resistance. As a result, your income benefits may be denied, medical treatment could be delayed, and you may even be misinformed about your rights. At Knoebel & Vice, PLLC we can help you understand your rights and industry terms such as “temporary total disability (TTD),” “permanent partial disability (PPD),” and “permanent total disability (PTD).” We can also provide guidance about choosing a doctor and coordinating benefits between the workers’ compensation carrier and your private insurance. Call today for a free consultation. If your injuries keep you from returning to work, in addition to securing workers’ compensation benefits we can also assist you with your Social Security Disability case. Even after we have won your case or settled your workers’ compensation claim, the attorneys at Knoebel & Vice, PLLC will continue to provide assistance with future medical benefits or disputes that might arise over the reasonableness and necessity of your medical treatment. 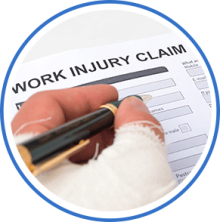 For more information concerning Workers’ Compensation, please visit the Office of Workers Claims and Comp Ed.